Brief History: Akiko Denkou is the leader of the Zodiac Precure Team. She was born and raised in Aurakako and goes to Aurakako Academy and Sometimes Decalo High School. At age 14 she was given the mantle of Cure Leo the Cure of Courage, Honor, Lightning and Light. One day she was walking home after a tough day at practice. She is a Martial Artist, the captain of the Cheerleading squad, girls basketball team, and the softball team. She just recently achieved the rank of Sho Dan(1st Degree Black Belt) in Shuri Ryu Karate. Personality: Outgoing, friendly, flirty, and cares a lot about her friends and teammates whether they be in sports or as Cure Leader of the Zodiac Precure Team. Unlike the bulk of the Pink Cures, she is athletic. However she is an average student at best. She is frequently tutored by her best friend since childhood Chisame Genshuku also known as Cure Libra. Attacks: Precure Leo Lightning Barrage, Precure Regulus Impact Slash, Precure Regulus Barrier. Weapon of choice: a pair of Sai. Other information: Used to wear her hair down most of the time, but nowadays keeps it in curly Twintails. Her hair length in Civilian form is mid-back length, her hair in Cure form is at least waist-length, maybe a bit longer. Height: 5'6" in human form, 2'5" in Fairy Form. Brief History: Nari, known in human form as Kaminari, is a Royal Fairy from the Kingdom of Climatopia. She was forced to flee with Kaze, Umi, and Princess Amaya after Princess Arina disappeared and was corrupted. She currently lives with Akiko, but she is the Fairy partner of both Akiko and Chisame who are also known as Cure Leo and Cure Libra. When trouble happens she joins in the fight as Cure Gemini. Personality: A combination of Akiko's personality and Chisame's personality. She is Athletic, and she's good at Academics. She cares deeply for all her teammates as well as all of her friends. Point of Interest: Unlike Akiko and Chisame, Kaminari/Nari can use her special power outside of her Cure form, but she can only use her attacks in Cure form. Her special power is Mimicry, however there is a limit to it. She can only retain five different forms and powers at any one time. Whenever she obtains an additional form outside of five, the form she has had the longest disappears and cannot be used again unless she makes room for it. Introduction: Balancing the gravity of right & wrong, Cure Libra! Weapon of Choice: A pair of hand-held scales. Attacks: Precure Libra Gravity Wave! and Precure Libra Gravitational Restoration! Strengths: Academics, Strategy, and Adaptability. Weakness: Not very Athletic at all. Similar to a lot of the Cures that are strong in Academics. Brief History: Grew up in Aurakako with Akiko/Leo, Kasumi/Aquarius, and Sayomi/Scorpio. Became a Cure at age 14. Is Childhood friends with Akiko/Cure Leo and frequently tutors Akiko since Akiko is more Athletic than Academic. Became a Cure shortly after being targeted by the Dark Weather Gem Brigade and turned into a monster. Has been best friends with Akiko/Cure Leo since the two of them could walk. Weapon of choice: a pair of Nunchaku that she can spin around and execute her attacks with. Strengths: Quick at decision making, doesn't like to stand around doing nothing for an extended period of time. Weaknesses: Tends to jump to unfound conclusions and Electrical Magic attacks. Personality: Temper prone, tends not to get along with the other Zodiac Cures that easy at first, but well enough to work together with them. Gets along great with Cure Scorpio. Attacks: Precure Aquarius Water Spout, Precure Aquarius Whirlpool. She can also generate a water force field. Introduction phrase(thanks to Tifa Symphonia♪ ): Guardian of the Life-Bringing Waters, Cure Aquarius! Brief History: Used to be best friends with Akiko and Chisame, but eventually went a different direction than those two did. Her potential to be a Cure awakened after she was targeted and turned into a monster by the Dark Weather Gem Brigade. Akiko and Chisame were in trouble so getting the spirit inside her, she was given the mantle of Cure Aquarius, Cure of water of the Zodiac Team. She was targeted along with Sayomi/Cure Scorpio shortly after Chisame awakened as Cure Libra. Height Fairy Form: 2'5" Human/Cure Form: 5'5"
Introduction Phrase: Icy Archer of the Zodiac Skies, Cure Sagittarius! Brief History: Umi/Narumi/Cure Sagittarius is a Fairy from the land of Climatopia. She was forced to flee her home just lika Amaya/Cure Aries, Arina/Cure Virgo/Cure Eclipse Virgo, Nari/Kaminari/Cure Gemini, and Kaze/Kazumi/Cure Taurus. She is a Tsundere just like Kasumi Yawa/Cure Aquarius. She also has qualities of Sayomi Suna/Cure Scorpio. She is looking forward to the day where her friend Princess Arina Luna Amaterasu/Cure Eclipse Virgo/Cure Virgo becomes good again. She attends school as a human with Akiko and the rest of the Zodiac Team, but she spends most of her time with Akiko at her house in her Fairy Form which is that of a blue seagull. Personality: Mixed personality type, combination of Sayomi/Cure Scorpio and Kasumi/Cure Aquarius. She tends to have a Tsundere type personality as well as a calming personality. Umi/Narumi/Cure Sagittarius element is ice. She calls herself the Icy Archer of the Zodiac Skies because she excels in Archery and has a perfect aim, just like the Archer that her name represents. Her and the other two Fairy Cures on the Zodiac Team live with Akiko Denkou/Cure Leo. Her attacks are based on Ice and the use of her Bow and Arrow. Cure Introduction Phrase: "The light of Antares is with you, Cure Scorpio." Attacks: Precure Scorpio Sand Tornado, Precure Scorpio Sandstorm, Precure Scorpio Sand Barrier. Weapon of Choice: A Jo Staff(four foot staff) with the Scorpio Symbol engraved on it. Strengths: Stealth, is easily able to take opponents by surprise. Weaknesses: Not very powerful when it comes to her attacks. Tends to defend better than she is able to go on the Offensive. Personality: Is able to get along great with the other Zodiac Cures. Looks to Cure Leo for instructions. Tends to follow instructions to the letter. Brief History: Sayomi Suna, also known as Cure Scorpio was targeted at the same time as Kasumi/Cure Aquarius. However, her injuries were much more severe. She ended up in a coma for close to three months. Once she awoke from her coma and was released from the hospital, she gained the mantle of Cure Scorpio. Her attacks are more Defensive Oriented, than they are Offensive Oriented. However, she is quite the fighter and is the cool calm one. She is the conflict resolution Cure of the team. When either Kasumi/Cure Aquarius or Umi/Narumi/Cure Sagittarius, have a Tsundere fit, she brings them down from that position. Now she is a very valuable member of the team. Strengths: Is easily able to immobilize opponents with her attacks. Can also cause them to fall asleep. Seems to be the healer type of Cure. Weaknesses: Tends to be shy and less than confident in herself. Not much of a talker. Personality: Submissive and shy. Very introverted. Tends to apologize unnecessarily for trivial things that shouldn't be apologized for. History: Born in the Fairy Kingdom of Climatopia, she fled along with the Zodiac Fairies to protect Aurakako from the evil that has taken over Climatopia. Her objective: Unite with the other Zodiac Cures and take down any and all evil that dares to harm Aurakako or any other City that may need to be protected. Introduction Phrase: Glorious princess of nature's forces, Cure Aries! Legal Name: Princess Arina Luna Amaterasu of Climatopia. Personality: Helpful, Loyal, Friendly, and always willing to take the blame for bad situations. Brief History: Forced to flea Climatopia with her sister Princess Amaya Hikari Amaterasu/Amaya/Cure Aries, she got separated from them while she was fleeing. In a panic, Kaze dropped the Virgo Amulet that was meant for Arina anyway. Arina's hairstyle is almost and almost exact duplicate of her older sister's in Cure Form, but completely different in her Civilian form. She was captured by the evil force that took over Climatopia and was brainwashed. What did the villains use to turn her? Her sudden taste for revenge against her older sister and her Fairy. Eventually, Eclipse Virgo was no more and she joined her sister and the rest of the Zodiac Team in battling evil as Cure Virgo. Goal: To make amends with her older sister and the rest of the Zodiac Team and to take down any and all evil forces once and for all. 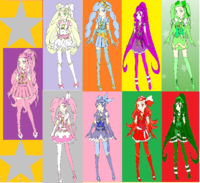 Introduction Phrase: Protecting the galaxy with the light of Spica, Cure Virgo! Height: Fairy: 2'6" Female Human/Precure Form: 5'7"
Brief History: Kaze was born a female fairy in the Kingdom of Climatopia and was given the mantle of Cure Taurus. 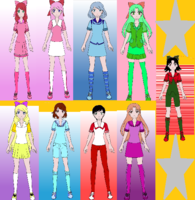 Cure Taurus's power rivals that of Sailor Saturn's She obtained her powers five years ago, but due to blaming herself for the disappearance and eventual corrupting of Princess Arina Luna Amaterasu of Climatopia/Cure Virgo/Cure Eclipse Virgo, she didn't feel right helping out her other two Fairy friends in battle at least. So she used a combination of magic and technology to disguise herself as male. He/she was told that if he/she were ever to transform into Cure Taurus again, he/she would be stuck as her true form, that being female forever. Kaze promised not to do that, however due to certain events happening in different situations, he/she had no choice but to reveal his/her secret to the rest of the Zodiac Team and reclaim her life as Cure Taurus. Point of Interest: Just like with Nari/Kaminari/Cure Gemini, she can use a limited amount of her power, mainly her strength, to clear obstacles if necessary outside of Cure Form, but can only use her attacks in Cure Form. The Fairy Cures of the Zodiac Team are the only ones that can do that. Attacks: Precure Taurus Metallic Whirlwind, Precure Taurus Metallic Twister, Precure Taurus Wind Barrier. Weapon of Choice: A giant Dual Bladed Axe. It's about the size of the Silence Glaive of Hotaru Tomoe/Sailor Saturn. Personality: Sadistic, Torchering, Evil, loves to dish out pain and create destruction. Goal: To get revenge on her sister and Kaze for leaving her behind. The new look for the Cure Forms will follow in the next post in this thread. New look Zodiac Team part one AKA Team Gemini. 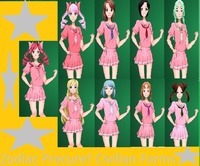 New look Zodiac Team part three AKA Team Taurus. 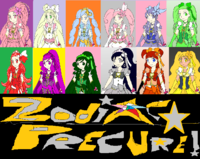 Here are two pics with my entire Zodiac Team Together. Brief History: Hoshiko is the eldest child of the Kita family, and goes to Aurakako Academy. She has four siblings, the one she’s closest to being Poppy. However, she doesn’t get along with her other sister, Hime. One day, when she had an argument with Hime, she ran off, and found a golden light. This golden light turned into an orange star shaped locket, with the symbol for Capricorn on it. She didn’t realise what it meant though for at least a year. Personality: The first thing that stands out about Hoshiko is her massive ego. She thinks she’s amazing at everything. Seriously. Though while it’s mostly a weakness, it can also be a strength at times. Another weakness is that she’s really stubborn. She won’t take no for an answer, well, unless she wants no, which means she won’t take yes for an answer. However, the role of “onee-chan” has made her very caring and protective of her family and friends. She's also energetic, smart, and outgoing. Attacks: Precure Sun Slash, Precure Midday Explosion. Introduction: The Sun that brings everyone light and warmth, Cure Capricorn! Hometown: Aurakako, Japan, and the Kingdom of Climatopia. Brief History: Izumi was the final born Princess of Climatopia. She was very graceful and kind, and seen as the perfect Princess. However, one day, when she was three years old, she was tempted by the Eclipse Kingdom to leave Climatopia, and not have to worry about the stress of being royalty. Being young and naive, Izumi believed this would be good, and fell for it. The Eclipse Kingdom then sent her to Earth, erased Izumi’s and the whole of Climatopia’s memories of the young princess. Izumi was brought up by the Haruko’s, a rich and graceful family located in Aurakako. Yume Haruko and her husband raised her as if she was their own. She had many maids and butlers, really posh lessons, and the best everything. Izumi really appreciated this, but when she was 14, she asked if she could possibly go to Aurakako Academy, to make some friends. Her “parents” agreed, and she was really happy and grateful. Personality: Izumi to this day, still remains naive. She often thinks things will end up the exact opposite way they do, and doesn’t notice some of the most obvious things ever. She’s also shy, and awkward, due to the lack of social interaction she had when she was young. However, she always tries her best, and is really really intelligent. She's also elegent, graceful and kind. Introduction: The moon that illuminates the dark night, Cure Cancer! Personality: Alianna Safir/Alpha Sapphire is a very Sadistic Villain. She hates all things good and just. She wants to flood as much land as she can. Her strengths include stealthiness, cunning, and ability to manipulate weather. Her weaknesses include electricity, Grass, and wind. She has yet to complete a mission for her Queen. Ever since Eclipse Virgo got Purified, she's been the number two general underneath Queen Ophiuchus. History: Her real name is Alianna Safir. Back in Climatopia, she was the original one that was to be given the Cure Aquarius powers. However, the minute she was given the mantle of Cure Aquarius by Queen Andromeda, she started abusing that power and causing more havoc and harm than help. It got to the point where she didn't care anymore and she ran away from the Zodiac Palace and went into hiding in the woods. Queen Ophiuchus found her eventually and promised her power and vengeance against the Zodiac Team and Queen Andromeda. She will not rest until the entire Zodiac Team is destroyed, starting with the Climatopian Royalty and their fairies! Power over water, ice, and weather. Blue Orb that can cause a deluge of rain and can create Climakami's. She has also learned how to summon older Precure Monsters from Max Heart all the way through Mahou Tsukai. She also has access to the Red Orb which can create Extreme Heat, and she also has access to the Jade Orb which can kick up Extreme Wind and Tornadoes. The Red and Jade Orbs can create Climakamis as well. Personality: Not much different, but acts like she is an innocent Civilian and is very outgoing and friendly. List of attacks: Weather related attacks, all of them unnamed. Personality: Omega Ruby also known as Olivia Ruvier is a cold, calculating girl that sees Chisame/Cure Libra as a rival of sorts. Unlike Chisame, she is not very nice and is snobbish to everyone around her. She doesn't really have too many good traits except for maybe her being smart. Her bad traits include, but aren't limited to: Cold, unfriendly, keeps to herself, doesn't talk much at all. History: Olivia Ruvier used to be best friends with Akiko and the earthling Zodiac Cures when they were younger. In fact she was childhood friends with the Earthling Zodiac Cures. 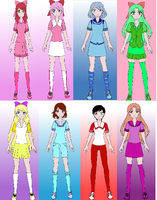 Then one day, when the group was younger, they all four started hanging out with each other and ignoring Olivia all together, broken hearted and down on herself she ran away never to be heard from again, until she appeared as Omega Ruby when she attacked the Zodiac Team that had yet to add Aquarius and Scorpio. She was the one that targeted Kasumi and Sayomi at even though they don't know that for sure, she disguised herself as male to throw the two off. After Cure Eclipse Virgo took over due to Omega Ruby's Failure, she was stripped of her powers and returned to her normal self. She regains her powers after Cure Eclipse Virgo is cleansed and returned to her old self. Note: She is actually human. 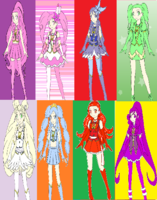 Series: Precure season / fanseries / original series (for crossover) / AU series. Appearance: 5 F 8 in tall, green hair down to middle of her back, wears the most expensive clothes you can buy. her hair changed when she acquired the Jade orb. Good traits: Pretty, stays focused and smart, cunning. Bad Traits: Greedy, wants thing for herself only, will do whatever she wants even if you give her directions. will hurt people if it gets her what she’s after. Likes: Gold, shiny, pretty and/or expensive things. Most anything if it would make her better then everyone else. History: Maddie was born into a rich family and from day one was given whatever she wanted and the best playroom money could buy. As she grew, she started asking for things almost daily and got those things without question from her parents. She was homeschooled early and continued it till she was 16. Now during that time her parents died from food poisoning and Maddie was now being taken care of by her uncle Jamison who unlike her parents didn’t believe in giving in to Maddie and what she wanted. He set her up to go to a real school and Maddie of course was against it, but went anyway. She had her own connections and credit cards (Yeah her Parents forced the bank to give her them) and Maddie was now going to fix everything the way she wants it and didn’t care who she hurt or what damage she caused. Write down a sample of how the character would act in any of these prompts. Must be in at least 100 words. •	Your character transferred school and had to introduce their selves in front of their new classmates. Maddie had been dropped of by her Uncle and blew him a kiss on her way out of the car even though she didn’t mean it at all. She walked into the school and pushed her way through the other students to the Principles office and minutes later she was being walked to her class. She walked in and told the teacher she was new. The teacher then spoke, “Class this is our newest student who is a transfer from being homeschooled, so be kind to her. Dear.. please tell us about yourself.” Maddie smiled and said, “Thank you teacher. My name is Maddie Wantsit and I’m 16 and I hope to do well here and make lots of friends.” She wrote her name on the board and walked to an open seat near the window. She sat down and the teacher came by handing out packets for them to study. Personality: Queen Andromeda is a loving caring mother that always does whats best for her children and her Kingdom. Her good points are: A caring mother, a loyal Guardian, very easy to get along with. Her bad points: Well she doesn't have very many bad points except she tends to forget the birthdays of her daughters and the Fairy Cures. History: Queen Andromeda, also known as Alana Amaterasu, was the only Zodiac Cure at one time. Since she was the original Zodiac Cure, she had the power of every Zodiac Cure Member. She was born and raised along with her sister Ophelia/Queen Ophiuchus. After the attack and take over of Zodiac Palace, now known as Eclipse Palace, she was able to find an non-corrupted section of the Eclipse Kingdom and was able to create a barrier as well as Create the Zodiac Castle. If any of the corrupted power of the Eclipse Kingdom were to come near the Barrier, it would disperse and leave the serene area around the Zodiac Castle alone. She spread out her powers into Twelve Items known as the Zodiac Items. Half of that power was in the Nine Zodiac Cure-kets and the three Zodiac Accessories. The rest of the Zodiac Powers were spread out into twelve Zodiac Crystals. Legend has it that once the Twelve Zodiac Crystals are found, the Zodiac Cure-Kets and Accessories will combine with the Zodiac Crystals creating the Zodiac Communicators, or Z-Cators for short. Powers: Weather Related Powers just like Queen Ophiuchus, but the light version of them.